The lighter space in this painting’s lower foreground looks like the back of a chair being offered to the viewer. If you took it, it would perhaps be on the understanding that you didn’t move anything: with a subtle, appealing order, the edge of the napkin lines up to the edge of a pan, and, in polite table talk, the left blue container peeks into the darkness to mirror the amount that the grey shape – a cereal box? – leans into the space of the table. This owes something to the example of the “primitive” Cornish painter Alfred Wallis, who sized objects according to how important he – rather than the academic laws of perspective – thought they should be. 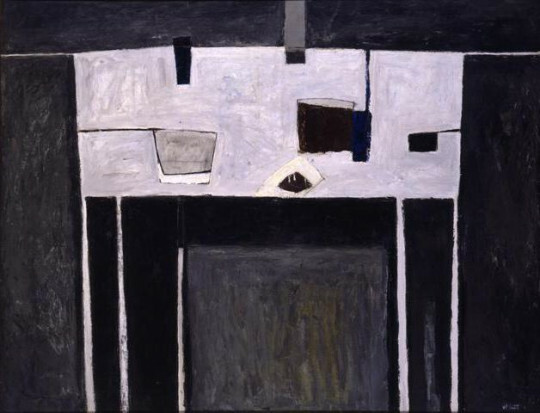 The two painters often also share a sense of practicality, and this table looks handmade, its roughly-hewn legs spindly but solid enough to suspend it in the black-grey void space. The space is also uneven and hand-made, scratched and sketched out with the expressive haste of a draughtsman who has decided the fact of the area’s colour, and filled it quickly and impatiently before moving on. But it is because of this scratched surface that the space seems to shift and shimmer slightly, as does remembered, non-painterly darkness. Scott, The New Decade: 22 European Painters and Sculptors [exh. cat. ](NY:MOMA, 1955), pp.74-5. Scott with Martin Attwood, Script for Recorded Illustrated Lecture [Held in British Council Visual Arts Library, 1961].